Runderella – An Owl a Day Keeps Burnout Away…right? My owls have been begging for places to hang out as a group! So, I gave them a notebook, a coffee mug, and a travel mug. Get yours online here. Tuesday afternoon started just like any other. I grabbed a cup of coffee and set up office at the picnic table in my backyard. I sat down and took a look at my to-do list and felt my stress level climbing. It’s been 3.5 months since I was fired. I’ve made very little progress with freelance design, which forced me to make my first withdrawal from my retirement savings account. As I battled my self-doubt, I noticed something fluffy fall from a nearby pine tree. A fledgling Blue Jay had just jumped from his nest. He was stunned and seemed a bit panicked at first, screeching for help. I waited and watched. No one came to his rescue. I didn’t even hear any Blue Jay calls, which is quite strange for my yard. So, I’ve been playing with my owls again. I think I’m having way too much fun coming up with new ways to let my silly little creatures take flight! While I still love everything Mid Century Modern and plan to continue to create more retro illustrations, my designs have taken a turn for the trail. Are you surprised? 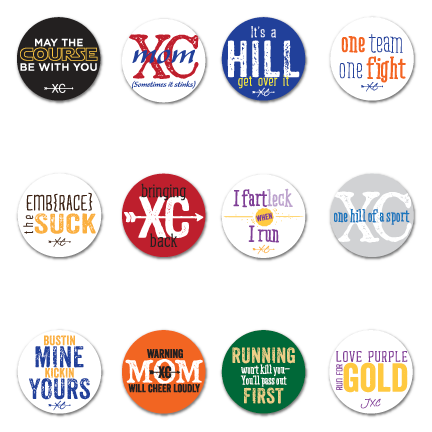 To make a long story short, I purchased a button maker and got an idea to help cover the cost of my son’s Eagle Scout project that happens to be for his cross country team. 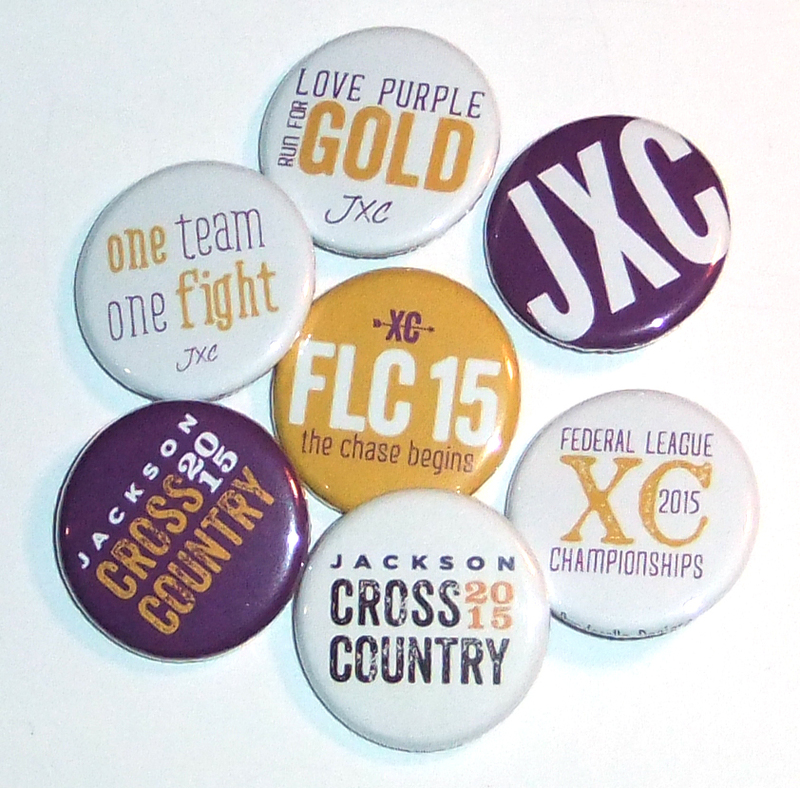 Cross Country buttons! So on a super long bus ride to a meet (I’m a coach too), I sketched out 3 pages of designs. Some appropriate for high school–others that are more appropriate for us older runners. Then, I asked the portion of the team that was on my bus what they would want to see on a button, leaving me with a grand total of 62 designs! With two weeks to go until our big home meet–the Federal League Championships–I made over 700 buttons to sell as a fundraiser. It was a fun project and the first time I really felt confident in my designs for runners. Of course, each of these designs will soon be available on my Society 6 pages on t-shirts, sweatshirts & mugs. Custom pinback buttons are also available on my Etsy page, too. Of course, what post would be worth your time without photos? So here they are!